We finally know all the juicy details about the forever-rumored iPad Mini so now it's small-tablet decision time. 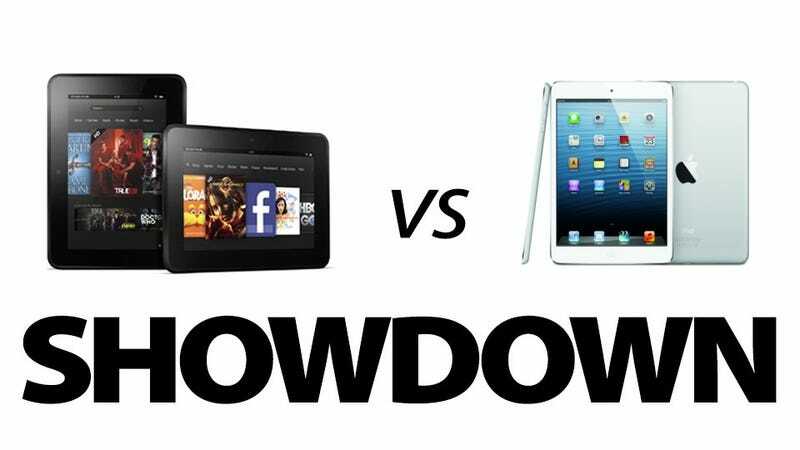 Is that svelte new iPad the tablet for you, or would Amazon's Kindle Fire HD be a better bet? Here's the breakdown. Is this even a question? If price is priority number one, the Kindle Fire HD's $200 16GB model is hard to beat, and Apple sure isn't one to beat competitors on price. In fact, the massive price gulf gives the Fire a bit of an advantage all around in a bang-for-your-buck sense if a $129 Apple-tax is something that makes you think twice. It's a no-brainer; grab the Kindle Fire HD. If Amazon Prime has got its lovely tentacles wrapped around your wallet, the Kindle Fire HD has a lot going for it by virtue of being welded right into that service. On top of that, the Fire's 1200 x 800 resolution, 216 PPI IPS display is damn pretty, and its dual-driver stereo speakers are clutch for headphone-free movie watching. The iPad Mini, on the other hand, boasts a somewhat larger display, coming in at 7.9 inches to the Fire's 7 inches, but that's about where the advantages end. Despite the bigger screen, the iPad Mini has a meager 1024 x 768 resolution. And, along with that, the iPad Mini screen has a mere 162 PPI—on par with the iPad 2—which doesn't even come close to the Fire's tight display. When you're streaming some movies on the couch, you're going to want a Kindle Fire HD. If you're handing over your tablet to sticky-fingered twerps of any age, there are a few questions you have to ask yourself. "Am I going to want to strangle them when they break it?" and "Are they going to use this thing to get in trouble?" It should go without saying, but the iPad Mini—at $329 or more a pop—is not the tablet you want little Billy dropping down the stairs. A broken Kindle Fire HD, on the other hand, is a bit less of a financial tragedy. On top of that, the Kindle Fire HD has that handy built-in Free Time feature, that lets you observe and limit what the Fire's used for, and for how long. The Fire might not boast quite the library of silly little time-waster type games and apps, but it'll do just fine. Junior should get a Kindle Fire HD, and maybe some iPad privileges if he's being well-behaved. When you're talking about gigabytes of storage per dollars of cash money, the Kindle Fire HD's 32GB for $250 is a sweet deal for the cyber-hoarder. The only problem is that that's as big as your cyber-closet can get. With the iPad Mini, on the other hand, you can push that sucker as high as 64GB if you want to. You're going to pay out the nose for it ($529 for the Wi-Fi only model $659 for cellular), but you can do it, if that's your thing. So take the Kindle Fire HD if 32GB sounds sufficient, or the a 64GB iPad Mini if you're serious about your media hoarding and have the scratch to spare. The Kindle Fire HD's got Kindle e-textbooks. The iPad Mini's got iBooks and Kindle e-textbooks. That about settles it right there. If your school is getting all tablet happy, you can bet they'll be cozy with iOS. A forked version of Android, on the other hand, maybe not. And when it comes to accessories like keyboards, there's always going to be good support for Apple products. Students are going to want an iPad Mini. This one is easy. The iPad Mini's got LTE (for a price) while the Kindle Fire HD 7 inch has...nothing. You could bump up to the 8.9 inch with LTE, but we're talking tiny tablets here, and besides, 250MB per month is laughable. The iPad Mini is also thinner, and a few tenths of a pound lighter than the Kindle Fire HD, if a few tenths of a pound really make a difference to you. The main thing, however, is the cellular connectivity. If you're out and about, you'll want an iPad Mini.